Green building and energy efficiency retrofits of affordable housing not only help struggling families find decent places to live, but also help create more jobs for the economy than traditional building methods. According to an Apollo Alliance study, 21.5 new jobs are created nationally for every $1 million invested in energy efficiency programs. In Greening Buildings and Communities: The Costs and Benefits, Greg Kats, President of Capital - E, a national clean energy advisory and venture capital firm, writes that “green building increases employment by shifting resources from energy spending toward design and construction, efficiency, renewable energy and recycling.” Kats also states that eight to 12 additional jobs are directly or indirectly generated from green construction; recycling construction was can create more jobs per ton than landfill disposal or incineration of the material. In the past two years, Mutual Housing California has spent $44 million on construction in Sacramento and Yolo County, including $37 million for new green construction that recycled waste. The Sacramento nonprofit also invested $7 million in energy-saving renovations at existing Mutual Housing properties. Sunseri Construction, which has built nearly 7,000 units of affordable housing in the past 20 years, listed 40 local contractors for each community built in Sacramento and Davis. Energy efficient retrofitting and renovations at older Mutual Housing communities such as Norwood Estates, Greenway and Twin Pines also help the economy in different ways. For example, of every $1 invested in construction, nearly 82 cents is produced for the local economy in induced and indirect activities. The National Association of Home Builders calculates that the annual, recurring impact of building a community such as the Highlands adds $2.2 million to local income, $372,000 in taxes and other revenue for local governments, and 38 ongoing local jobs to the economy. Ron La Perle, owner of La Perle Concrete, has been designing walkways and pouring concrete at private homes for decades. Since the recession totaled the demand for private homeowner work, Mutual Housing California renovation projects have kept La Perle in business. While working on renovations at Twin Pines and Norwood Estates, among other Mutual Housing communities, La Perle also has hired others. From his son to a former bus driver for Sacramento County, affordable housing construction is creating jobs for La Perle and others like him. Mutual Housing has plans for more affordable housing communities on the drawing boards. The multifamily developer has plans to build a community for agricultural workers and other low wage families in Yolo County and is expanding its footprint to meet the need in other counties. Mutual Housing’s construction of 90 energy-efficient townhomes, apartments and lofts in North Highlands finished less than a year ago. 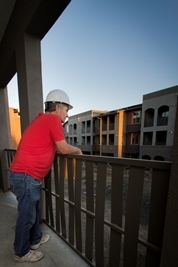 Construction of 69 apartments at New Harmony Mutual Housing Community in Davis should be completed by February. Founded in 1988, Mutual Housing California develops and operates well-designed rental housing for modest-income households. The communities have 2,750 residents.